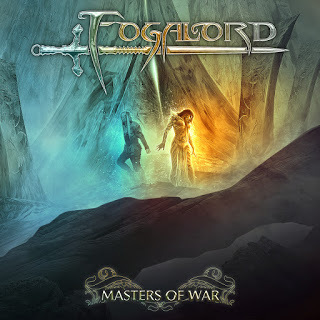 Coming onboard with renewed intensity, Italian symphonic power metal newcomers Fogalord quickly took the scene by storm and formed this newfound hero in a scene that all comes from them incorporating more of their trademarked elements into their newest effort. Now after a five-year gap following their initial appearance, the groups’ sophomore release will initially be released June 2, 2017 on Limb Music. Much like their past efforts, the group is simply intent on offering the attack from a strong series of epic rhythms that add plenty of greatness to their approach. There’s efforts like the title track, Rising Through the Mists of Time and When the Blizzard Awakes that are based around the tight, flowing riffing here that propels this one along at rapid paces by offering an endless series of fiery speed metal riff-work in the greatest sense of the bands’ past. The rhythms are fast, vicious and built for glorious harmonies when utilized in conjunction with the blistering drum-work and shimmering keyboards that are draped all over the music here that adds an overwhelming atmosphere of epic grandeur that makes for a fun time. While these here are the overwhelming factors on display here, there’s a slight discrepancy here on The Storm of Steel and Absence of Light where the album dropping in intensity for bland mid-tempo gallops that just don’t have any kind of impact like the previous tracks, making for a somewhat lessening approach than normal and causes this one to lose a lot of its steam during the middle of the album where all those tracks are placed. Spreading them out on the album would’ve been preferable, yet that’s still an obvious factor about this one.